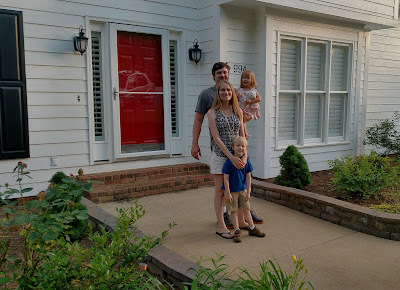 In honor of the upcoming one-year anniversary of moving into our new home, I’d like to share a special memory with you. By special, I mean embarrassing. It’s about the time I had to ask my new neighbors for help because I locked my toddler inside my house. It was a beautiful summer day. I spent the morning rushing around the house cleaning and packing in preparation for our trip to my parent’s home in Georgia. The packing alone is an ordeal. Mom has to make sure I have enough crap to keep those kids silent, happy and occupied for four plus hours while strapped into car seats. While DVD players are lifesavers, moms still need to plan for backup activities. And snacks upon snacks upon snacks. After a quick clean up (enough that someone entering the home would not run out screaming), I did all the packing. All the diapers, wipes, medicines, clothing (and extra clothing) were stuffed into the bags. Then, I put my not yet two-year-old daughter in her crib in her bedroom for naptime. My son decided to be my helper by carrying out bags and other necessities (by necessities, I mean crap from the dollar store) to the car. I had my handy dandy baby monitor placed on top of the laundry room dryer to keep an eye on my daughter while we went in and out to load the car. We turned it up full blast and left the door to the laundry room (which opens into the garage) open. While I was busy and distracted with the DVD player set up, my son was playing in the garage. Or so I thought. When I pulled my head out from the backseat of the car, I noticed that I couldn’t hear the monitor’s constant static sound. And, then, I saw the door to the house was closed. When I saw the door closed, I immediately got a bad feeling that my day was about to get a whole lot worse. Sure enough, I went to the door and tried to open it. Nope. I could not even push it open a centimeter. My son realized he was in trouble before I even said the words and quickly confessed that he had flipped the door stopper down before closing the door. The only unlocked door to our house was now shut and could not be opened because of the heavy duty floor stopper. Inside the house were my keys, my phone, the baby monitor. AND MY BABY. I spun around in circles and threw my body against the door several times before realizing it was no hope. Without a phone, I had no choice but to run to my new neighbor’s home and ask for help. I had to quickly explain that I accidentally locked myself out of the house and locked my baby inside the house alone. This was one of the very first impressions I made, y’all. She passed her phone to me immediately to call my husband. Who, of course, did not answer the one time I have an actual emergency. I called every number for his workplace I could think of. Then, I sent 911 text messages. And I got nothing. So, my pregnant new neighbor and her mother-in-law came over to my garage to see if they could help me break in. Yep. Break into my new home. To rescue my baby. After what seemed like an hour, one of the women suggested finding something hard and thin enough to squeeze under the door to somehow knock the door jam up. We found a paint scrapper, and lo and behold, it worked. I very awkwardly thanked my new neighbors and rushed inside to rescue my baby (who was still sound asleep). And to give my son the lecture of all lectures. After realizing I had blown any chances of faking my new neighbors out and making them think I have it all together, I actually felt a little relieved. No need to pretend here! I’m already the mom who locked her keys, phone and baby inside her house. So, it’s been almost a year. This week, that neighbor showed up on my doorstep. She needed to borrow my phone. Her son had accidentally locked them out of the house and locked his baby sister inside.